Well it was all looking so good at halftime on the 18th September. The Bees were firmly ensconced in second place in the Championship with the plaudits of all the pundits ringing in their ears. A well-taken Neil Maupay goal was the least they deserved as they had totally outplayed a toothless Ipswich Town team marooned at the bottom of the table and the long-overdue first away win of the season should already have been homed and hosed, so dominant had the Bees been in a totally one-sided first half. That was the zenith and high spot of the season so far and it seems hard to believe that here we are at the end of October – at a time when given the peerless free-flowing performances displayed in most of the first seven league games a majority of Bees fans would have expected the team to have further demonstrated its promotion credentials – now on an appalling run of eight games without a win (nine if you include the Arsenal Carabao Cup tie) and seemingly in free-fall, having dropped like a stone to sixteenth place, with the seven points separating them from the playoff spots beginning to represent a seemingly insuperable chasm. So what has gone wrong in the last six weeks? Were we really as good as we seemed in the first few games or merely flattering to deceive? Is our decline terminal or can we recover and still fulfil some of the extravagant expectations for the season? These are the key questions that every Brentford supporter wants answering and over the course of this article I will do my best to provide my own viewpoint on each of them. Let’s firstly look at the positives. Reviewing the footage of the opening seven games of which we won four and only lost one, ridiculously, at a Blackburn Rovers team that scored with its only shot on target, it is clear that Brentford did at times play some exceptional and exhilarating football with the midfield and wingers breaking forward with pace and directness to create a myriad of chances for the voracious and suddenly deadly Neil Maupay who scored 7 times in his opening 5 games and probably missed twice as many opportunities as well. Ollie Watkins too seemed to have come of age and was direct and deadly scoring 4 times and he was too much for many teams to handle, a Premier League player in embryo. Sergi Canos, who resembled a little boy lost for much of last season was showing welcome signs of recovering form and confidence and he was rotated with new signing Said Benrahma who was already settling down into English football and demonstrating his trickery and ability on the ball with four assists. The Bees scored 14 times in those 7 games with the aforementioned players accounting for 12 of them. Only 2 came from midfield with Lewis Macleod, finally restored to fitness arriving late in and around the box to score well-taken goals against Rotherham and Nottingham Forest. Josh McEachran was imperious, seeing openings that were beyond most mere mortals and opening up defences with the accuracy of his passing. He was averaging nearly 50 passes per game with an impressive 84% accuracy rate. The influential Ryan Woods seemed not to be missed after his departure to Stoke City. The defence had seemed fairly watertight with only 6 goals conceded and it was clear that the Directors of Football had picked Charlton’s pocket when they emerged with the fabulous Ezri Konsa for a bargain fee of around three million pounds. His confidence, defensive solidity, ability on the ball and reading of the game were astounding for a 20 year old and he formed an impressive central defensive partnership with the equally young and gifted Chris Mepham and it was clear that they would both shortly be on the radar of predatory Premier League teams. The Head Coach, Dean Smith alongside his trusty assistants Richard O’Kelly and Thomas Frank kept their hands on the tiller and there was a sense of calmness, consideration, control and confidence in most things that they did in terms of team selection, tactics and substitutions. There was therefore much that was positive in the early games but even then despite the excellent performances and results there were a few clouds on the horizon and warning bells that were sounding. The Bees had the most attempts on goal and the least against them in the division but remained wasteful and careless at both ends of the field. Blackburn should have been put to the sword as Brentford wasted 61% possession and 11 shots to somehow lose a game they had dominated to a poorly conceded goal. Aston Villa had also out-pressed Brentford and cancelled out their midfield but Brentford weathered the storm, brought on runners and tacklers in Nico Yennaris and Kamo Mokotjo and turned the game around, taking the lead near the end and then wasting two gilt-edged chances to score a certain match-clinching third goal before conceding a soft free kick in the 96th minute which was poorly defended for a last gasp Villa equaliser. Stoke too were totally out-footballed with Watkins scoring a brilliantly worked and taken goal after a move involving almost the entire team but a defensive aberration and misunderstanding between Mepham and Dan Bentley again meant that two valuable points were thrown away. Goalkeeper Bentley, who had a spell of the yips last season before recovering his form and consistency made another error when he fumbled a totally innocuous shot (although it was hit so softly that it barely even merited that description) from Forest’s Matty Cash into his own net in a game where the Bees recovered from that shock to score a late and fully deserved winner. Brentford also persisted in playing without a recognised left back since the loss of Rico Henry a year ago and Yoann Barbet, for all his height and danger at set pieces, always looked like an accident waiting to happen. Brentford are all about risk and reward and the decision was also taken not to bring in any experienced cover in the Transfer Window for Neil Maupay and to rely upon the untried 19 year old Marcus Forss as well as moving Watkins centrally when required. What might not have been taken into account when this decision was made was the unpredictable temperament of the volatile Frenchman. Maupay earned a fully merited 3 match ban for a daft off the ball stamping incident at Aston Villa and remains a yellow card (or worse) waiting to happen in every game and is currently on the verge of another ban. Forss struggled to make an impact on his debut at Blackburn and is now long-term injured and Watkins remains the only other option unless Romaine Sawyers reprises his occasional false nine role. Dean Smith turned a negative into a positive by deciding that a captain would be nominated for each game, a unique solution to the long-term problem of a lack of leadership and experience within Brentford’s squad which is the youngest across all 92 Premier League and EFL teams averaging a mere 24.3 years. The Brentford model demands the introduction of a constant influx of young, talented and emerging players who can be developed and improved and then sold on (after being replaced) as soon as another club offers more than their valuation. This means that fans can enjoy watching players of immense promise strut their stuff in a welcoming and encouraging environment but also suffer the naive mistakes and inconsistency of the young and inexperienced. What also became apparent early on is that the players had either been instructed or taken it upon themselves to stand up for themselves and each other which led to some over-reactions and mass confrontations one of which resulted in a horribly niggly and cynical Forest team receiving 7 cautions and yet Brentford, so often the innocent party, allowed themselves to lose their discipline and earn 5 yellow cards of their own. The good therefore massively outweighed the bad in the opening 7 games but things have changed dramatically over the course of the current winless run. The goals have largely dried up with only nine being scored in eight games and three of them came in one fruitless match at Preston last week. Why is that as Maupay continues to look dangerous and has scored 4 times recently, as well as perpetrating the worst miss since Cardiff last season at Norwich on Saturday when he managed to hit the bar of an empty goal from 4 yards out? You need to look at what is – or more importantly – isn’t happening around him to explain our goal drought and current lack of success. Maupay now represents pretty much our entire goal threat given that Ollie Watkins has suddenly become a peripheral figure, flitting in and out of matches without taking them by the scruff of his neck as is his wont. His poor form might well be explained by a lingering toe injury that is partially incapacitating him but we are only rarely seeing that trademark dropping of his shoulder and venomous shooting. His only recent goal dribbled in at Preston after a helpful deflection and when we really needed him to produce when down to 10 men against Bristol City his Exocet crashed against the inside of the post and came out rather than going in – so narrow are the margins between success and failure in the Championship. We need him fit and back on form so badly given the paucity of our attacking options but he probably needs to be rested, something that we cannot afford to do. So much of Sergi Canos’s hard work has come to nothing with little end results as his shots and centres have been blocked or found a defender, but he has continued to keep his head up and his exceptional goal at Preston will help improve his confidence. Said Benrahma has threatened only to deceive and exhibited a shocking lack of discipline when two stupid and needless fouls saw him dismissed against Reading and a naive and needless attempt at a tackle gifted Leeds a late free kick in dangerous territory from which they scored an undeserved equaliser. It would appear that he is now seen as an impact substitute rather than the influential match winner that we all think we possess. We need to see much more from him but he firstly has to regain the management’s trust. Given the stuttering up front the midfield need to have taken up the slack but the real problems are currently in the engine room where it is difficult to pick the best blend at present and nothing seems to be working. McEachran had the boost of scoring his first ever goal recently with an angled free kick against Birmingham but he has lost form and is understandably distracted by the birth of his new child. We need him and the likes of Sawyers to start zipping the ball around with pace and incision. Hopefully Josh will shortly come again as he is the fulcrum who now, with the departure of Woods has to win the ball or take it off the goalkeeper or back four and set the tempo and get us playing. Lewis Macleod was expected to make late runs into the box which he certainly did at the beginning of the season but he seems to have lost his Mojo and impact and has become a peripheral figure. He rotates between a box-to-box and a more advanced role but is providing little goal threat, the occasional tackle and he now averages a minuscule 25 passes per game with a 73% success rate – unacceptable figures. His rival for the box-to-box position in Nico Yennaris is suffering from a lack of match practice and currently averages under 19 passes per game. All this means that greater responsibility has to fall upon Romaine Sawyers, but he too appears slightly confused by his role. Is he supposed to be the most attacking of the midfield trio or should he hang back more given Macleod’s ability to get forward? He has been neither fish nor fowl and remarkably he has yet to obtain either a goal or an assist and his shooting has also lacked its customary venom and accuracy. Kamo Mokotjo has filled in effectively both in holding and box-to-box roles but suffered a serious looking injury at Norwich. When you look at the statistics and see that the entire Brentford midfield has 3 goals and 1 assist between them after 15 games you can see where the problems lie. Our greatest strength has become our main weakness. With so few options the Head Coach can only keep juggling what he has in the hope that something will come good and it would appear that the McEachran/Yennaris/Sawyers axis will prevail although there is hope on the horizon with Josh Desilva rapidly gaining match fitness in the B Team after joining from Arsenal where he was highly rated. At first glance it seems that he is a powerful and skilful left footed box-to-box player with a excellent shot on him and it might be that he is brought into the squad on Saturday. It is a tough ask of a youngster with no EFL experience but we need him to contribute and come good very quickly. Emiliano Marcondes, the gifted Danish attacking midfielder was inked in for an attacking midfield role alongside Sawyers but has yet to kick a ball this season after taking a pummelling from a Watford team that did not seem to understand the meaning of the expression “friendly match”. He had looked so promising in the preseason and will undoubtedly offer a goal threat if the club can get him fit and healthy – something that is by no means certain at the moment. Midfield has for so long been the strength of the Brentford team and it is disconcerting to see how quickly it seems to have unravelled and the right blend needs to be rediscovered quickly if results are to improve. This in my opinion is the key to Brentford achieving anything for the remainder of the season. As one part of the team ceases to function effectively so another also misfires. Daniel Bentley is a mistake waiting to happen and has so far contributed directly or indirectly to 7 opposition goals that could well have been prevented. He cost us the win against Reading when 2 abysmal handling errors gifted goals to the visitors and turned what looked like being a comfortable home win into a desperate slog for a point. He was rested for two games in which Luke Daniels did little wrong although his hesitation was partially responsible for the Leeds equaliser. Recently restored to the team,Bentley saved a penalty kick on Saturday and hopefully will recover his lost form and become an asset rather than the liability he currently is. Apart from a penchant for conceding stupid free kicks and late crucial goals from set pieces the defence has overall not performed badly. Mepham was badly missed at Preston where the team caved in and conceded 4 eminently avoidable goals and – Sod’s Law – just when he was needed the most our spare centre half, Julian Jeanvier was injured which allowed Yoann Barbet to prove categorically that he is not a Championship calibre centre half. Mepham received a second yellow card from another myopic referee after a non-existent holding back offence which followed a stupid yellow card obtained by pushing an opponent away in a melee. Yes, he was defending a team mate who was being kicked on the floor but it was still a naive booking which cost us dear given that Bristol City who were second best for large parts of the match went on to win with another last second goal. In reality there is little wrong with the Brentford back four which will be strengthened immeasurably when Rico Henry recovers match fitness and is restored to the team having missed the last 13 months of action. Yes we will miss Barbet’s strength and height defending the far post but Henry offers so much more going forward and is a potent attacking threat. Moses Odubajo, recovering his fitness still, is also available to cover in either full back position or even as an auxiliary winger when required. When I listened to all the preseason preview shows I was both exhilarated and horrified by so many respected pundits tipping the Bees for promotion. Brentford have remained snugly and safely under the radar for so long and been underestimated by so many and in my view, long may that state of affairs continue. Now things are totally different as teams have finally taken notice, sussed us out and have worked out how best to stop and frustrate us. Teams now try to press us very high up the pitch knowing that Bentley will invariably throw the ball out short. This has resulted in some hair-raising near misses where disasters have narrowly been averted and ensured that we find it harder and harder to beat the press. We have also seen a lot of time wasting and tactical fouling in an effort to slow us down and stop us playing. Apparently the ball was only in play for 30 minutes in the recent game against Reading who achieved new lows in gamesmanship when they prevented the taking of a free kick on the edge of their box for almost 6 minutes, aided and abetted by a totally ineffectual referee. This has resulted in poor discipline and frustration and a couple of totally unnecessary red cards. Sawyers in particular has been fortunate not to see red when HE saw red. The key to this problem is keeping a calmer head and getting the pace and zip back into our game. If Brentford keep moving the ball quickly as they customarily do when on song then they will tire out the opposition and create chances. This needs the midfield to start functioning again and it is in the laps of the Gods as to when and if this will occur. The elephant in the room is the loss of Dean Smith to Aston Villa. My last article dealt at length with the potential ramifications of his departure and the likely appointment of Thomas Frank to replace him as Head Coach. This has now taken place and the new man is an unfortunate 0 for 3 from his first three games. Not much has changed yet in terms of team selection, bar the reinstatement of Bentley, and tactics although there was a change late on at Norwich when Brentford moved Watkins alongside Maupay up front in the hope of snatching a late point. He has appointed a fellow Dane in Brian Riemer as the first of two Assistant Coaches and there is speculation that Bees legend and current B Team Head Coach Kevin O’Connor might be promoted to first team duties, but that is something for the near future. Brentford find themselves at a crossroads. The season is a third of the way through and the team is currently in the middle of a slump. This is mainly because the negatives now massively outweigh the positives – a total reversal of the trend in the opening 7 games. Luck too has turned its back on the Bees in several games and it is not long since they put on a deeply impressive performance at Elland Road that fully merited a victory. The attempted recovery from a three goal deficit at Preston also clearly demonstrates that the spirit is still there but confidence is slowly draining away. Something has to change quickly. It might be a piece of good fortune but I firmly believe that you make your own luck and someone needs to grasp the nettle and make something happen. You win as a team and you lose as a team and we need a Sawyers, a McEachran, a Canos or a Watkins to start delivering. The blend is not working at the moment and there needs to be a revamping of the midfield to make the best use of the resources that we possess. Thomas Frank needs to start making his influence felt through making some subtle changes and ensuring an improvement in discipline. I firmly believe that Brentford will quickly recover form and start to climb back up the league table. How far I am not quite sure, but if the midfield starts to contribute again, Watkins regains his Mojo, Maupay stays on the pitch and keep scoring, Bentley recovers his form and confidence and Dasilva and Henry can be successfully integrated into the squad then I feel that the season can be turned around. That is quite a lot to ask for but just as quickly as things turned bad, I believe they can turn good again. You do not become a bad team overnight and Brentford at their best are a very good team. I had roused myself from my torpor and lethargy and almost finished writing a long and analytical review of the first couple of months of the new season when news broke of Dean Smith’s departure to Aston Villa. So I have scrapped all of my previous observations, gone back to square one and tried to assess his impact upon the club and then I consulted my crystal ball to see how we might do without him. It would be entirely wrong not to start by thanking and paying tribute to Dean and his long term assistant, Richard O’Kelly who is also accompanying him to Villa, for all their efforts, skill and hard work over a near three year period – a lifetime in Championship terms where the average lifespan of a manager is around ten months. Smith was not the club’s first choice to succeed Marinus Dijkhuizen and caretaker Lee Carsley but terms could not be agreed with Pep Clotet, and judging by his subsequent failure at Oxford United perhaps we had a lucky escape. Carsley had done an excellent job of restoring confidence, fitness and morale amongst a group of players who had been dismayed and confused by the chaotic disorganisation of the short and ill fated Dijkhuizen era. Smith proved to be an exceptional choice. Calm, measured and intelligent he soon got the squad onside by showing that he would treat them as individuals and grown ups and always be available to speak to them on a one to one basis. He ensured that standards would be maintained both on and off the pitch and ensured that the squad joined in the club’s outstanding work in the local community. From his previous spell at Walsall under the parsimonious Jim Bonser, he was used to making bricks without straw and he totally bought into the Brentford philosophy. He understood that he was there to motivate, teach, improve and develop a group of outstandingly talented young players, knowing full well that the best of them would at the right time be sold from under his feet once a club further up the food chain met or even surpassed their value. This has to be the Brentford way of doing business for the time being, allowing them to compete with, outthink and outperform clubs with far greater resources but more stereotyped and outmoded ways of thinking and doing business. Smith never – publically at least – bitched and moaned about losing star players such as Scott Hogan, Jota and Ryan Woods as he realised that the club could not match the bloated salaries on offer elsewhere and he knew that they would be replaced with another influx of untried but talented youngsters. Teacher that he is, he simply got on with the job of improving the players under his control and Neal Maupay might well be the most striking example of how a young striker who was struggling to find his feet last season, missing open goals, not anticipating chances, with the ball clanging away from his imperfect first touch has under Smith’s guidance now developed into a predatory marksman, currently the top scorer in the country, but – unlike Hogan – someone who also plays a full part in holding the ball up and setting up play. Maupay is not alone and the improvement of others such as Chris Mepham – a Premier League star of the near future – Ollie Watkins and Josh McEachran has been startling, testament indeed to the quality of Smith’s coaching and development ability. This to me has been his greatest strength and is not surprising given that he made his bones as a youth team coach at Orient and Walsall. He would not be human if he did not bemoan the lack of more experienced recruits either up front or in a defensive midfield role but that is not the Brentford way of doing things and he fully understood why massive sums could not be invested in such players or even in bringing in loanees who could potentially provide a short term impetus. Why should we pay to improve someone else’s players? January was a case in point as Maupay was stuttering and Lasse Vibe had finally recovered his potency in front of goal, scoring six times against the likes of QPR, Norwich and Aston Villa as well as a predatory and crucial late winner in a tight game at Reading. Given that he was out of contract at the end of the season and likely to leave on a Bosman free transfer the Brentford business model dictated his sale, admittedly for an eye watering sum to China. All fine so far but the view from the top of the club was perhaps that our chances of reaching the Playoffs – themselves a one in four lottery – were too low to merit an investment in a new striker. Perhaps in retrospect a mistake? Even with this handicap the Bees came within a whisker of gatecrashing the top six and one can only conjecture whether Dean Smith felt that he was managing with one hand tied behind his back? To lead his team to three consecutive top ten finishes was undoubtedly a magnificent achievement given Brentford’s miniscule budget compared to so many of their rivals, buttressed as they are with ineffable parachute payments, ostensibly rewarding them for their failure in relegation from the Premier League. The football too was often sublime with every player confident on the ball and their game was based on initially playing the ball out patiently from the back, switching it from side to side probing for weaknesses and then fast flowing attacking football featuring an alluring combination of pace, short passing, dribbling and astute switching of play. At their best the Bees were almost unstoppable and the likes of Fulham, Derby and Aston Villa were sent packing with their tail between their legs. And yet…. and yet….. despite the quality on offer and our delight and gratitude at having such wonderful fare to feast upon, the feeling lingered that possibly, just possibly we should have done even better and got over the line certainly to reaching the Playoffs. Perhaps such thoughts are patently unfair and Smith was indeed overperforming, but given the quality that we possessed I feel that even more could have been accomplished. We travelled away to the so-called bigger teams without fear and apart from at Newcastle and recently at Derby we invariably put on a performance, stifled the opposition and dominated chances and possession. But we could never quite get over the line and win such games and with the exception of Brighton we have never won at the ground of a promoted team although often going close. Credit has to be given to the opposition of course but last season we drew at Middlesbrough and Fulham, both games we dominated and should have won, and this season the pattern has already been repeated at Stoke, Aston Villa, Ipswich and Leeds. Four drawn matches when the performances fully merited twelve points and eight points have been thrown away – perhaps the difference between promotion and being an also-ran. Smith’s team was the youngest in the Championship and perhaps understandably they made the naive mistakes of the inexperienced. They had a soft underbelly and rarely seemed able to close out a tight away game. All too often an individual mistake, a lack of clinical finishing, a set piece, careless and catastrophic defending and it has to be said refereeing errors would ensure a late goal against (or two at Loftus Road last season) that would cost us dear. Smith would correctly protect his players in public and perhaps he castigated them when necessary behind closed doors, but little seemed to change and the same errors and shortcomings were repeated. Tactically he could be very astute as he was in his final game in charge at Elland Road when he learned from what happened at Villa Park when his ball playing midfielders were totally overrun. He left out McEachran and Macleod and their more energetic replacements Mokotjo and Yennaris wrested control of the congested midfield. For the last couple of years he has also been assisted by Thomas Frank, a former manager of Brondby and he has appeared to have played an important part on the touch line. The team’s pressing has also improved immeasurably. Frank made his name coaching young players in his native Denmark and he was originally brought in to help players make the step up from the B team to the first team squad. Frank is understandably seen as the new head coach in waiting and as we are waiting impatiently for the white puff of smoke that announces the appointment of Smith’s replacement the question remains, how much of the team’s success was down to him? More importantly, would the players, used to the demeanour and approach of Dean Smith, respond well to the ministrations of Frank? Given his two years of service it would be strange indeed if Frank was not given the opportunity of becoming head coach, but this is Brentford we are talking about and the club has never been averse to producing a rabbit from the hat and making a left field appointment. Director of Football Phil Giles did intimate that no decision had yet been made and that some potential candidates would be approached and spoken to. Nathan Jones and Danny Cowley are two highly promising managers whose names have been mentioned and who knows, perhaps they and others will come under consideration. Brentford’s motto has never been “if it ain’t broke then don’t fix it.” It’s been more “let’s try and improve it,” so maybe someone new will arrive. Whoever takes charge will inherit a fantastic squad bursting with ability and potential. Players are also returning from injury and it is likely that Matthew Benham will authorise squad strengthening in January and just as importantly refrain from selling any star players if the Bees remain in the running for promotion. Dean Smith did an incredible job. He steadied the ship, improved individual players, totally bought into the Brentford approach and has more than laid the foundations for success. The system at the club is far more important than any one individual and the new man need do no more than tinker with what has already been done (although perhaps a return to man to man marking rather than zonal defence would be welcomed). Normally a new manager or head coach has to sort out the mess of his predecessor but this is a totally different situation. Very little has to change for Brentford to make the slight improvement needed to gain promotion. Hopefully Frank or whoever else is chosen can organise and motivate them to eradicate the slight errors that are costing them so dear at both ends of the pitch. As for Dean Smith, he leaves with our thanks and gratitude for a job exceptionally well done. Just as our players harbour ambitions why shouldn’t our management staff? The Aston Villa job is a dream come true for him and given time and support he could well bring them the success they crave. I’m not well enough informed to have a educated view as to whether he’s inherited a poison chalice. For his sake I hope not as he deserves far better. Every once in awhile – and it is a extremely rare occurrence and treat – you pick up a book and it takes you over completely and transports you to a different world or tugs at your heartstrings and emotions reminding you of what once was and is forever lost. There are not many authors who possess the skill and imagination to do so and even fewer who predominantly write about football. I have just finished such a book that I so enjoyed that I thought I would share a few thoughts about it. Duncan Hamilton spent his early years as local journalist chronicling the achievements of the European Cup winning Nottingham Forest team and becoming a trusted observer and confidant of the immortal Brian Clough. This provided him with the material for his wonderful memoir of those heady days entitled “Provided you Don’t Kiss Me: 20 Years with Brian Clough.” In 2012 he bettered that with “The Footballer Who Could Fly,” a marvellously evocative, nostalgic and sentimental tribute to his father and an account of his difficult relationship with him and how football alone gave them a touchpoint and something to share and talk about. 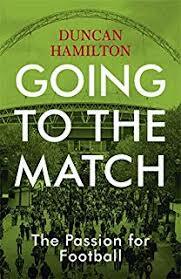 Now with “Going To The Match” Hamilton has yet again proved to be a marvellously gifted observer quick to pick up the nuances of football and what it means to supporters, and he is able to describe his thoughts in beautiful and luscious prose. Hamilton kicks of by revisiting LS Lowry’s famous painting of “Going To The Match” and illustrating how the painter’s passion for the sport is so beautifully and accurately expressed and depicted in this glorious and ageless piece of artwork. This viewing re-energised and inspired him to take a journey throughout the entire 2017/18 season to watch football at all levels of the game, from Sunday kick abouts to International matches and describe not only what happened on the pitch but how the on-field action made him and ideally the other spectators feel. His Odyssey took him to such diverse venues as Newcastle, Fleetwood, Nottingham, Glasgow, Manchester, Wolverhampton and Berlin and like all the best authors he makes fascinating detours into the worlds of art, cinema, literature and politics in order to highlight the crucial part that football plays in everyday life. His attention wanders from describing the games that he is watching to bringing up half forgotten memories and he brings into sharp focus some of his footballing heroes from the past such as Stanley Matthews, Billy Wright, Bobby Robson and Brian Clough. Hamilton spent much of his childhood in Newcastle and is particularly scathing about the Mike Ashley regime and how he has failed to grasp what Newcastle United means to the Geordie Nation: “He doesn’t get it. he owns the flesh and the body of Newcastle – but not the soul; and he never will because he seems unable to recognise what it is, or what it is worth to those who do.” I have never read such an accurate and cutting description of a misfit owner. Hamilton is no mere nostalgic, endlessly harking back to the old days and claiming how much better they were, as he rejoices in the talent, brio and sheet athleticism of modern day heroes such as Harry Kane, Mo Salah, Dele Alli and Kevin De Bruyne but with his broad perspective of watching the game at all levels for so many decades, Hamilton can place them all into historical perspective and compare and contrast them to similar icons from the past. Hamilton is excellent on what it means to be a fan and the dichotomy of how their inherent bias allows them to excuse gamesmanship and foul play executed by their heroes yet decry the same behaviour by the opposition. We rail at the excessive spending of other teams and of massive ticket prices yet still implore our own chairman to bet the ranch on success. I found myself nodding in agreement at so much that Hamilton wrote and particularly in how we return to football every week because it helps some of us to enjoy life more and others to endure it. Football is a common language that breaks down barriers and something that often seems to take over our lives. This book did that to me for several days and I recommend it wholeheartedly. GOING TO THE MATCH BY DUNCAN HAMILTON IS PUBLISHED BY HODDER & STOUGHTON AND COSTS £25.